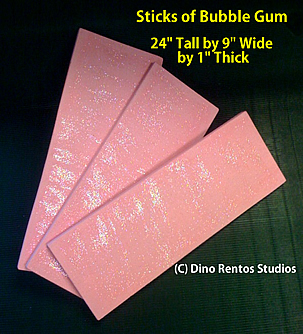 Big Foam Bubblegum Stick Prop - 24 Inch - Dino Rentos Studios, INC. These bubblegum sticks are perfect to add to your candy display! Each stick is 24" (2 Feet) tall by 9" wide and 1" thick. They are coated with sparkels for a sugar coated look. Price is for 3 sticks.